Peek into the past, present, and future of China on this comprehensive tour of a diverse country with an amazing history. This tour weaves the best major sites with personal experiences — from a walk on the Great Wall, to lunch in a local family’s home, to the discovery of the incredible Terra-Cotta Warriors. Relax in the tranquility and beauty of Guilin. Explore the ancient water village of Zhujiajiao and enjoy a boat cruise along the canal. Take in a chinese acrobatic show, and explore vibrant Shanghai with its futuristic skyline. This trip to China is unforgettable. Savor a variety of traditional Chinese food including Peking Duck, noodles and dumplings. Take a tour of the Forbidden City including the Treasure Hall. Relax in the tranquility of the beautiful city of Guilin. While in Shanghai, take in an amazing acrobatics show and visit the ancient water village of Zhujiajiao. Meet a Chinese calligraphy master and learn how to write using this ancient art. Pre and Post Tour Extensions. Start and end your vacation rested. Discover China’s capital city and its political, economic, and cultural center. Explore an interesting mix of ultra-modern architecture and old-world culture. Stay in the heart of Hong Kong's bustling shopping district of Kowloon. See the city’s most popular sites on a comprehensive tour of Hong Kong Island. Learn about the lifestyle of Hong Kong’s fishermen at Aberdeen Fishing Village. 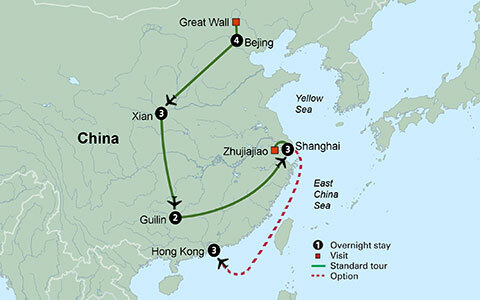 Journey to China, perhaps one of the world’s most fascinating countries. Experience the bustle of Beijing, the ancient splendor of Xian, the tranquility of Guilin, and the modern cityscape of Shanghai. Your adventure begins in Beijing, the vibrant capital city. From the start you will find yourself immersed in its profound history and fascinating culture. Ease your way into the local culture as your tour manager shares with you a few key phrases of the native language. Visit the home of the Giant Pandas, China’s national treasure, at the Beijing Zoo. Explore a pearl factory and learn about the different varieties of these underwater gems. Walk in the footsteps of emperors at the Summer Palace, considered a masterpiece of Chinese landscape artist design. The remainder of your day is at leisure. This evening, join your fellow travelers for a welcome dinner including world-famous Peking Duck. China’s legendary landmark, the Great Wall, is yours to discover. During your dramatic visit, walk along a portion of this 3,700 mile marvel! Visit a jade workshop to learn how local artists create these masterpieces. Feel the excitement of the 2008 Summer Olympics when you view the Olympic Green. Have the opportunity to take photos of its two famous structures - the Bird’s Nest and Water Cube. Tonight, enjoy a unique method of cooking during a Mongolian barbecue dinner. Contemplate history with a visit to Tiananmen Square, one of the largest public spaces in the world. Then, visit the Forbidden City, an awe-inspiring palace complex that has been home to 24 Chinese emperors for almost 500 years. You also visit the Treasure Hall. This evening you could choose to watch a traditional Peking Opera and explore the Donghuamen night market. Explore the world-famous Temple of Heaven, an ornate sanctuary where Chinese Emperors worshiped their gods. Interact with the locals as they do their morning exercises like Tai Chi or watch them playing cards or board games. Enjoy a once-in-a-lifetime rickshaw tour through the Hutongs, the narrow streets of ancient Beijing. With help from an interpreter, learn about a local family’s history and way of life when you share lunch with them in their Hutong home. Next, meet a Chinese calligraphy master and learn how to write using this ancient art. A short flight brings you to China’s interior city of Xian, starting point of the famed Silk Road. Your day begins with a visit to the excavation site of the Terracotta Warriors. 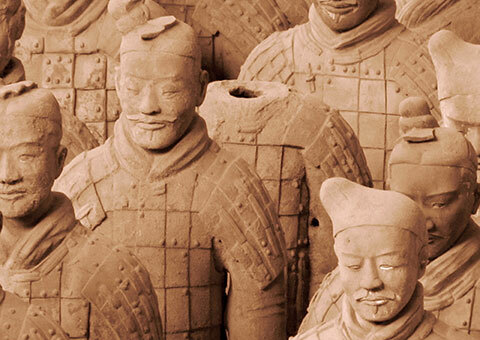 This incredible vast clay army, 8,000 strong, was created to guard China’s emperors in the afterlife. Be amazed by the sheer number of them and their detailed features! Visit one of the most famous Buddhist temples in the world, the towering Wild Goose Pagoda. Marvel at the impressive structure built during the Tang Dynasty to house Buddhist treasures. Tonight you may choose to enjoy an opulent Tang Dynasty dinner and show. Discover centuries of Chinese history at the Shaanxi Museum and view many ancient relics including bronze wares, pottery and murals. Visit the Xian city wall, the largest and best-preserved in China. Explore the bustling Muslim Quarter inhabited for hundreds of years. Tonight, enjoy a traditional 20-course Xian dumpling banquet with a variety of flavors. Fly to the beautiful city of Guilin. Visit the colorfully lit Reed Flute Caves with its wonderful underground scenery including imposing stone pillars and interesting rock formations. Enjoy traditional Guilin rice noodles for lunch. Stop at Elephant Trunk Hill, the symbol of the city of Guilin. Make the most of a full day at leisure. Take time to relax or explore Guilin on your own. You may choose to take an optional excursion which includes a cruise on the Li River where you’ll admire the landscapes that have inspired artists and poets for centuries, followed by a visit to Yangshuo’s bustling market to bargain with the locals for souvenirs. Depart for bustling Shanghai, the economic heart of China, whose futuristic skyline will leave you speechless. Visit the Shanghai Urban Planning Exhibition Center and view the centerpiece of the museum, a vast scale model of urban Shanghai as it is projected to look in 2020. Watch a video that paints a picture of the Shanghai of the future. Enjoy lunch at a celebrated local restaurant known for its xiao long bao soup dumplings. Explore Old Town’s narrow streets and relax in the tranquility of the Yuyuan Garden. Tonight, soak in the energy and excitement of the Chinese acrobatic show. Enjoy a full day excursion to the water village of Zhujiajiao, an ancient city located on the banks of Dianshan Lake. After more than one thousand years, Ming and Qing dynasty buildings still stand and 36 ancient stone bridges cross the canal that runs through the center of town. Set out on a boat ride on the canal and have time to shop. Tonight you may choose to dine at the French Concession and enjoy an evening cruise on the Huangpu River. Discover the treasures of the Shanghai Museum, home to priceless artifacts that span China’s rich history. Enjoy a locally-guided tour of the waterfront district known as the Bund which runs along the western bank of the Huangpu River. Famous for its gorgeous colonial buildings, you’ll feel as though you have stepped back into 19th century Europe as you wander among the impressive Gothic, Baroque and Renaissance architecture. The remainder of the day is at leisure. Tonight, bid farewell to China at a dinner with your fellow travelers. Your tour ends in Shanghai. China is on China Standard Time (CST), 12 hours ahead of Eastern Standard Time (EST) (13 hours during Daylight Saving Time). China generally uses AC 220 volts, in contrast to the US standard of AC 110 volts. An adaptor (which changes the physical plug) and/or converter (which changes the electric current) are necessary if you plan to use an appliance with voltage different from the standard within the country you are visiting. Please note, if your appliance has dual voltage you may still need an adaptor for the plug. When packing your electronic items for travel, please review the converter electric current level to make sure it is the same or greater than the items you are planning on using. If you plan on utilizing or transporting a sleep apnea machine, please remember to pack an extension cord and adapter plug to ensure proper function. No significant elevation is encountered.